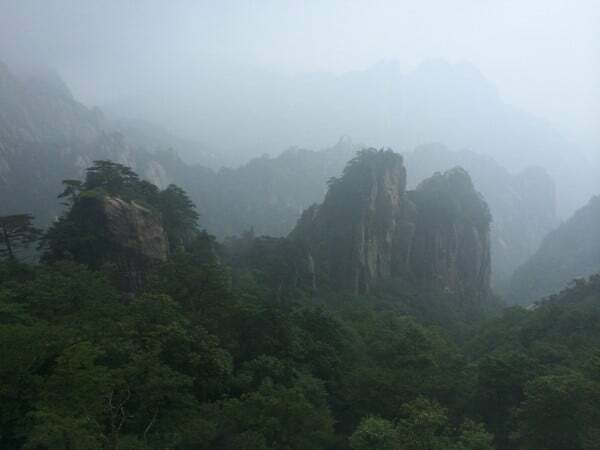 When we were standing in a thunderstorm, with spectacular lightning, sheltering from the torrential rain that was threatening to go over the TOP of my shoes it didn’t seem to be a good idea that we’d said “screw the weather” and continue with our planned trip to Huangshan, the Yellow Mountain. 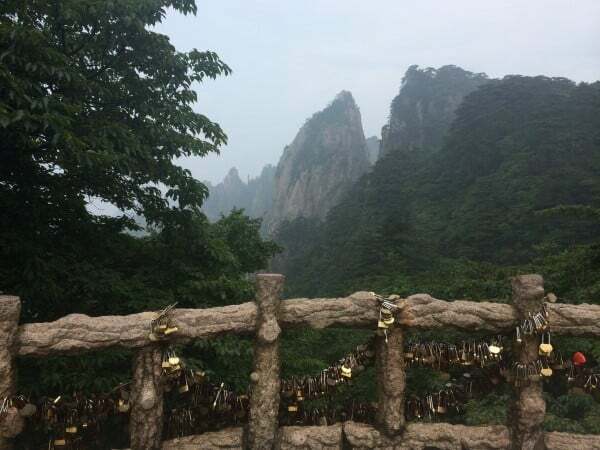 We’d already conquered fears and Mount Huashan, and despite the calf trembling pain of the few days after that, we’d gone back for more. 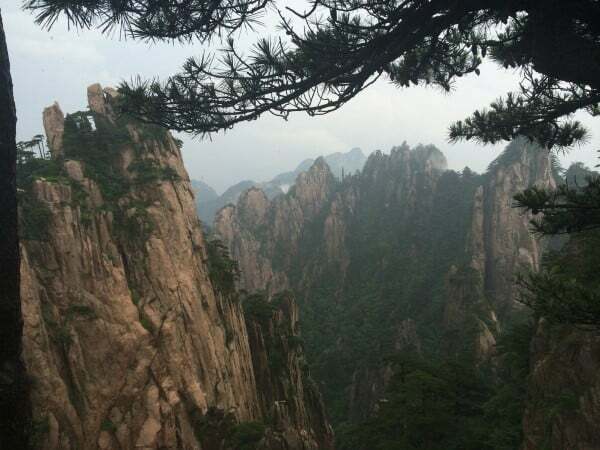 This time, it wasn’t a sacred mountain, just another item on the Bucket List. Not as easy to get to either. 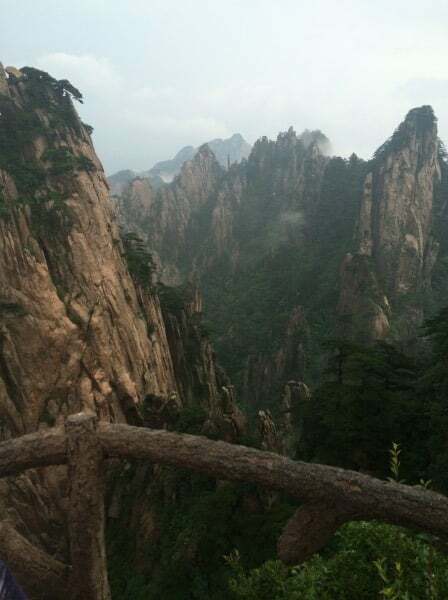 To get here, after our sojourn to Nanjing, we’d had to take an afternoon train south to Huangshan. 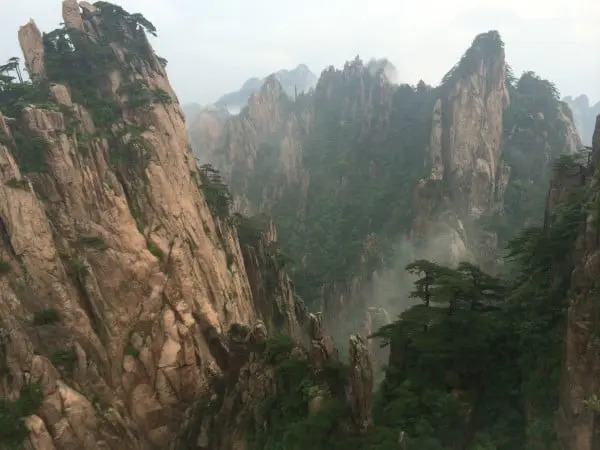 The train station that actually is not near the mountain Huangshan, but actually the town of Tunxi (but it’s called Huangshan). We stayed in our cheapest accommodation to date, at 65 CNY, we paid just GBP 6.50 or (USD 10 ish) for our 10 hours or so in the very good value, but don’t look too hard Yongle Hostel literally on top of the station in Tunxi. 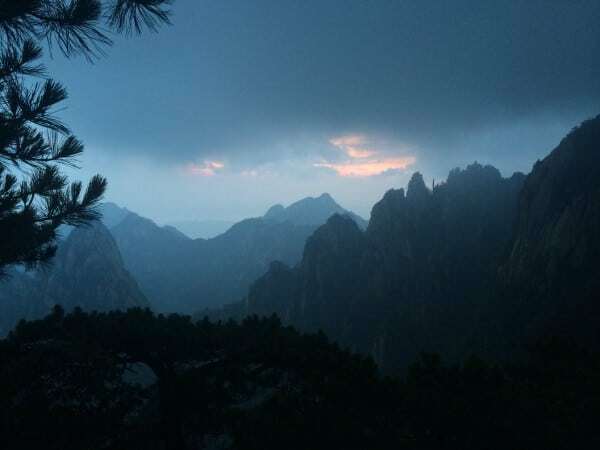 We stumbled over the bus to the town at the base of Huangshan, paid our 22 CNY and bounced around the back seat of the bus for an hour until we arrived in Tankou. 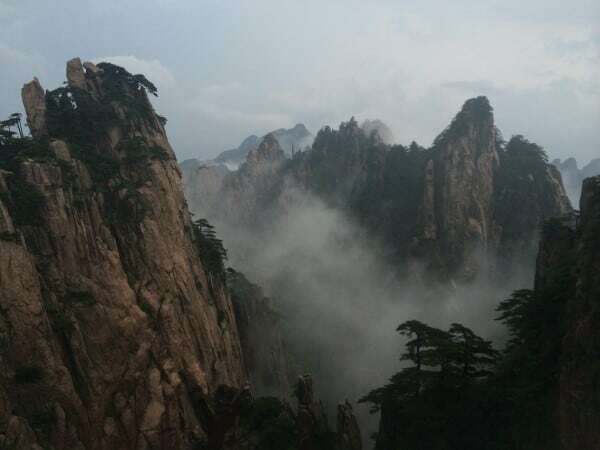 This is often also called Huangshan, just I think to confuse us westerners. We sweated our way down the main street, looking for both the bus station and also the Ala Hotel, which cunningly provides pictures of what it looks like in the dark, but not the daylight. 7 locals later we were in the lobby asking to store our bags until we arrived back for our booking 36 hours later. No problem. The great team at the reception desk through a three way English-Chinese conversation also provided what I think is the best map of Huangshan. 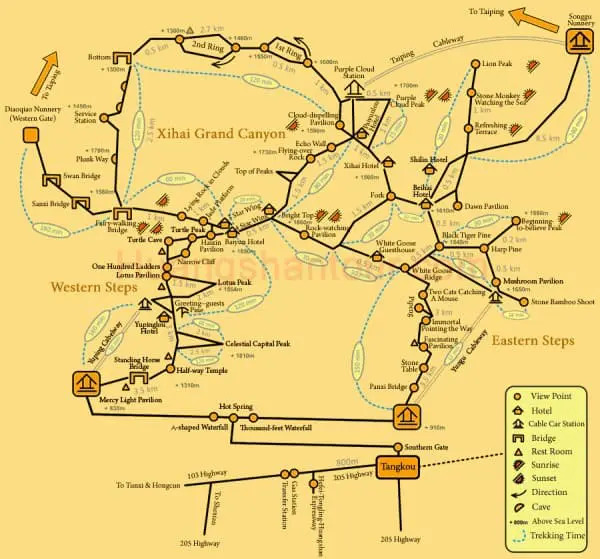 They suggested a route for us to walk and arranged to buy our bus tickets for on onward trip to Hangzhou once we’d returned. Minutes later we were heading for the bus station and the 18 CNY tickets to take us to the Huangshan ticket office. 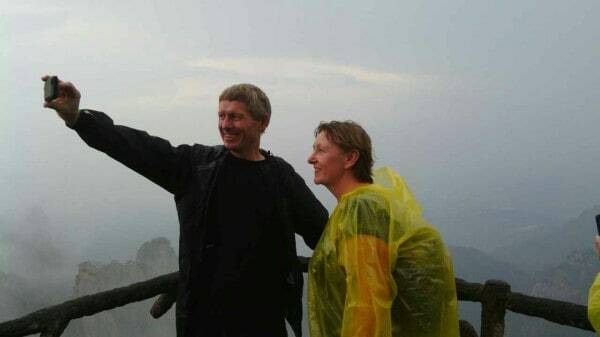 This was going to be another of those not cheap visits to a Chinese mountain. 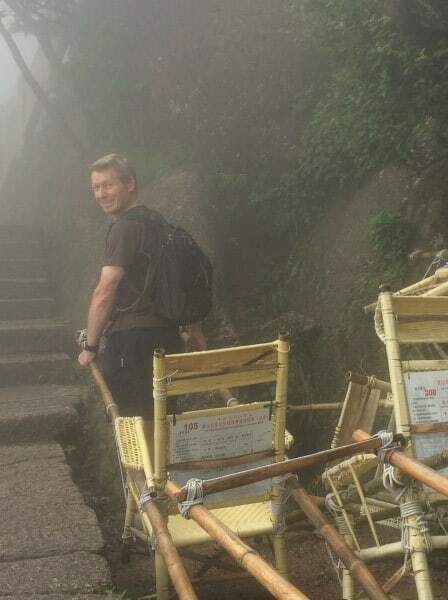 Our shuttle bus took us to the East Steps base, where in torrential rain we bought our 230 CNY (YOUCH! 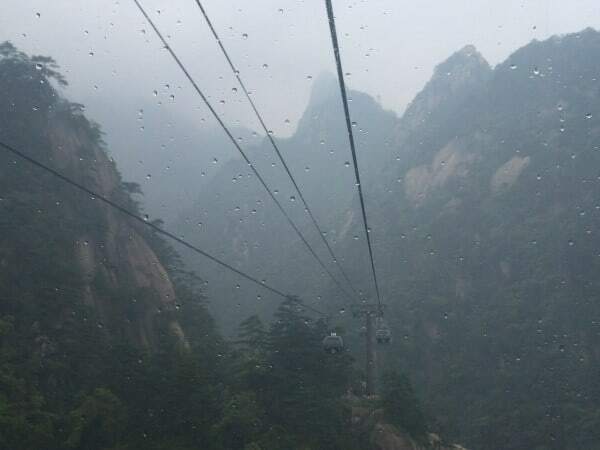 that’s GBP 23) tickets for the mountain and the single cable car ticket, another 80 CNY. 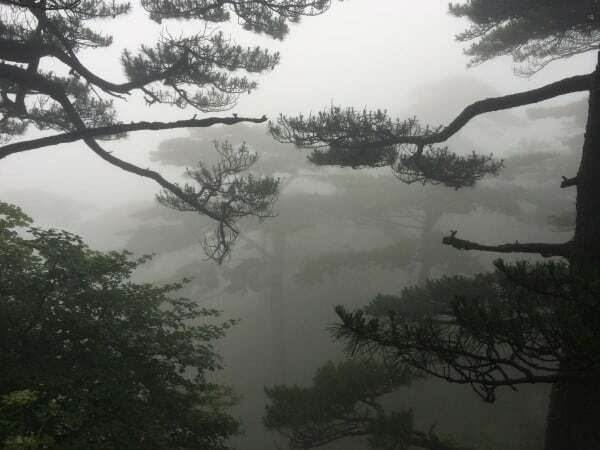 By just after noon we were zooming up a very misty, drizzle bound Yellow Mountain on the Yongu cableway, or telpher. 10 minutes into our foray onto the mountain we were donning waterproofs. Then we were sheltering under the trees with 20 other Chinese tourists considering the folly of our ways and listening to the hugely loud thunder cracks. 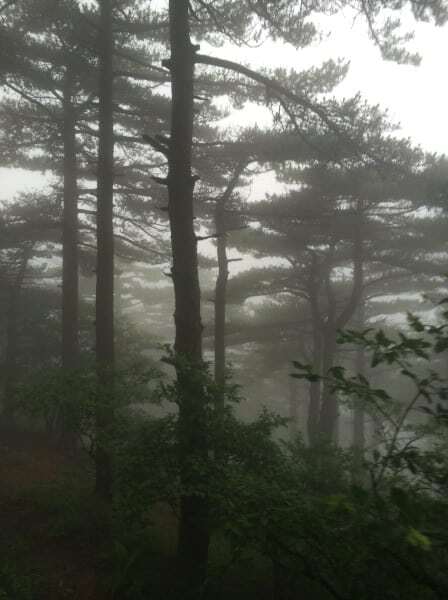 But we were here, and we trudged on, contemplating the mist through the trees, and the grey outlook now below us. 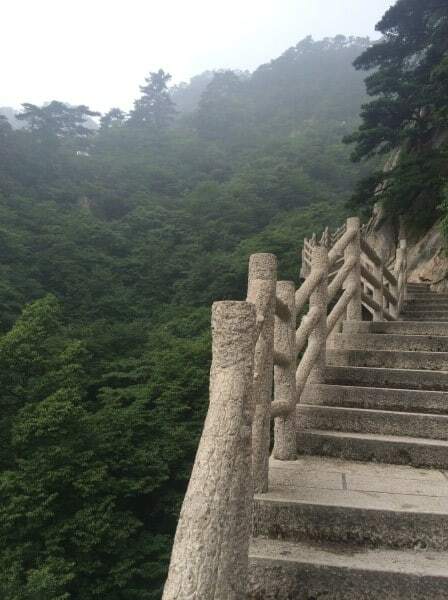 Similar to Huashan, there are no trails as such , it’s all concrete or stone paths, and there are steps upon steps upon steps. 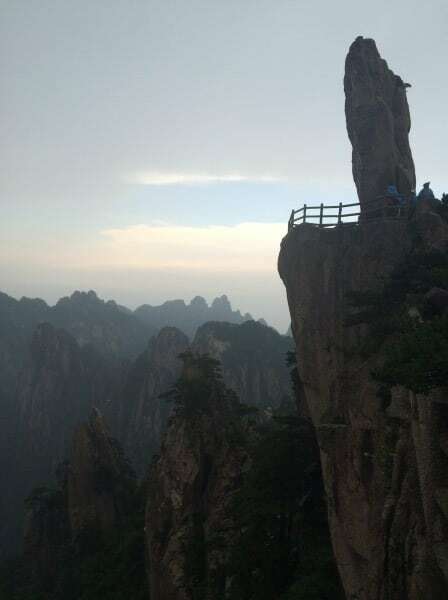 We’d made it to poetically named “Beginning to Believe Peak” – named apparently, by a disbelieving tourist that there was anything worth looking at up here. 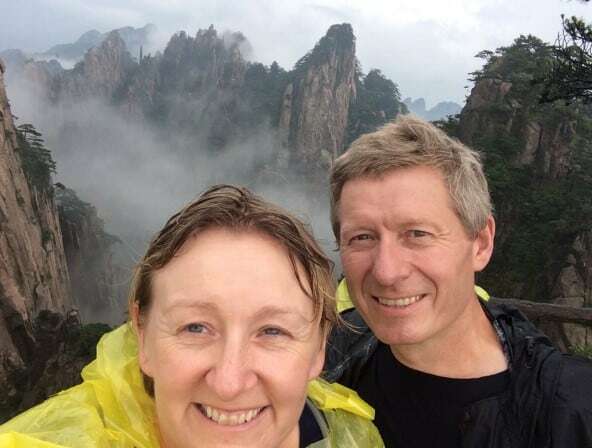 We were wet, our feet were sodden and we were contemplating the selfie that would contain just our faces, rain day hair and a grey background, when all of a sudden the mists cleared. Magical. We were there on Beginning to Believe Peak, suddenly believing. 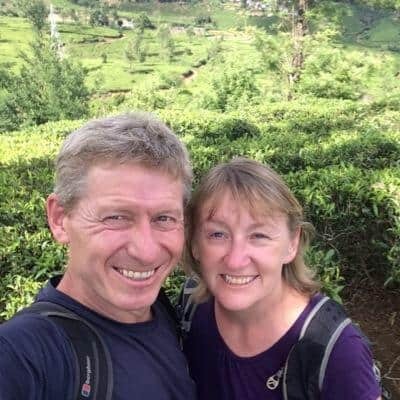 It wasn’t just us, we met a Chinese national, back from 30 years in the USA, who snapped a shot of us, as she said it mirrored the delight that she felt too, beginning to believe. 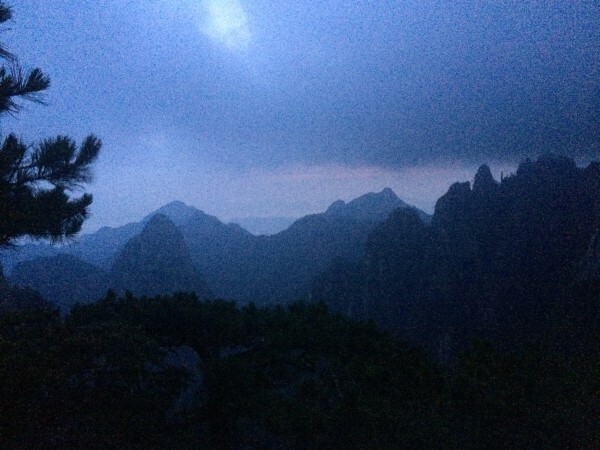 We were staying on the mountain to try and catch a sunrise, as unlike Mt. 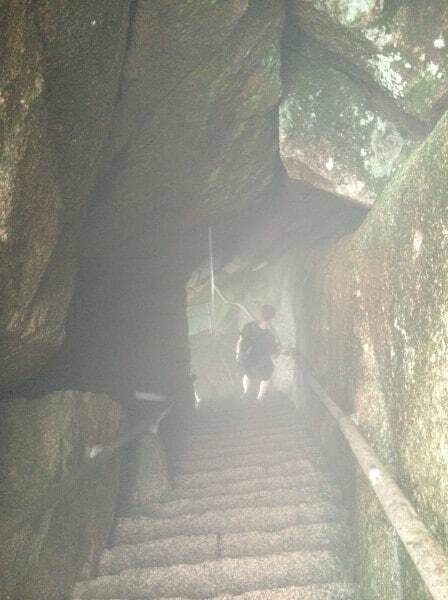 Huashan, it’s not possible walk up Huangshan in the dark. 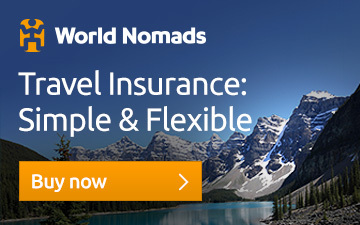 So your options for sunrises and sunsets are to stay on the mountain or stay on the mountain. There are quite a few places to stay. 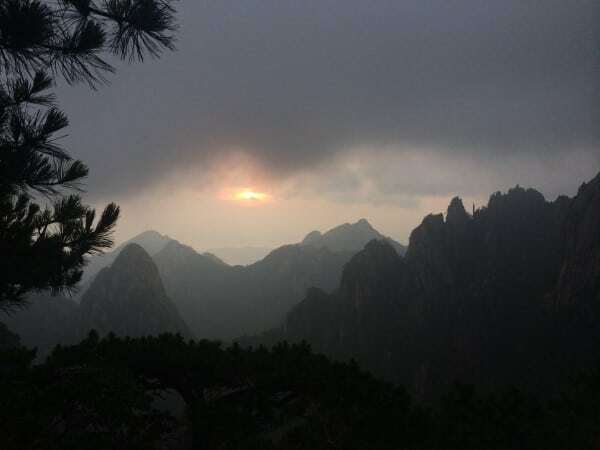 We’d chosen the cheapest best located for a sunrise, the Behai hotel and headed there to check in and claim our beds before continuing our hike around the summit. We’d gone for dorm beds at the Behai, which even so cost us 240 CNY each. Separate male and female dorms. Double rooms started at 720 CNY, and we figured that we’d be getting up at 0430 for the sunrise anyways. We ended up rooming next door to each other and without a keycard for the rooms – which have 6 bunk beds each. The usual in cheaper chinese beds – there is a wooden board involved and not a great deal of comfort. It was clean though, with clean bedding (the reviews on TripAdvisor worryingly had warned that there wouldn’t be) and there was a bathroom in each room – it had just been a regular room, with the twin beds replaced by three sets of bunks. I ended up sharing with 2 sets of Chinese girls, who stayed in the room all afternoon and evening glued to a very loud TV watching what I can only imagine was crap Chinese TV. I suspect the content wasn’t relevant, because there was even a program in American English broadcast. That was crap too, but they watched avidly until I made a point of turning the lights off…. Food options on the mountain are not limited at all. They’re only limited by what you want to spend. It looked like a great full menu in the restaurant at the Behai – which also had one of the fastest in China wifi connections available in the public areas, but it was expensive. We figured that a main course each would have set us back around 150 CNY.. so we headed outside, using the experience of Nige’s roomie who hailed from Marin County (how cool, a neighbor!). Corn on the cob, a parcel of sticky rice and two Chinese sausages (contents unknown) each for the bargain cost of 24 CNY. Beers were off the menu being too expensive, but we’d lugged tea bags up the mountain and had a kettle in the dorms, so we were going to drink tea. I’ve written before about the noise that the Chinese make. They excelled themselves at the Behai. We were bedding down at around 10pm, with alarms set for 0420, with a start planned for 0430 (we’d come back for showers after the sunrise). Sunrise was scheduled to be 0518. And still the noise continued in the corridors, and in adjoining rooms. Doors banging. The usual shouting conversation going on outside the door. Damn. Should have brought the earplugs up the mountain. None of my fellow roomies snored. But two of them did start to get up at 0330, but that’s ok, because I was wide awake by then, because clearly some other groups were also getting up, and had applied the “If I’m awake, then all the rest of you are going to be too” technique of justifying their early rise. Stumbling out in the dark we followed the crowds, up more steps and as they headed to the designated “best place to watch the sunrise” and as they continued on, we peeled off to the right, found ourselves a wall over the cliff and claimed our spot. It was glorious. Watching the scene go from dark, to dawn to the sun rising. Watching the mountains and trees slowly take form and the landscape change. 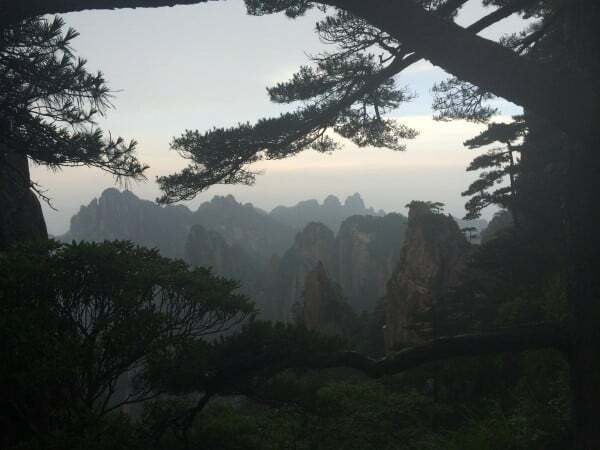 It was worth the extra cost, the sleepless night, the irritation at the smokers in the cafe area where the wifi was and the annoying know it all travelers who persisted in competing with Chinese noise levels and giving us the benefit of their considerable experience. The weather didn’t get any better. In fact the sunrise was the best part of the day – as the sun rose the mist rolled in and the drizzle started. The wind got up and by mid morning it was 40 miles an hour at the top. 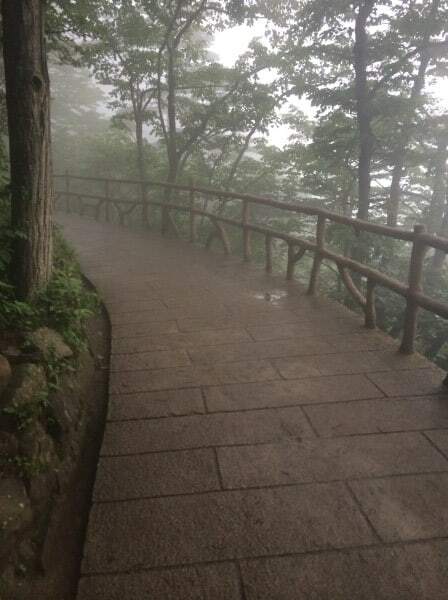 We’d planned to walk around the peaks at the top, summit Lotus Peak and Celestial mountain, but they were closed. Our calves thanked us immensely and agreed to walk down the mountain instead of taking the cable car down. 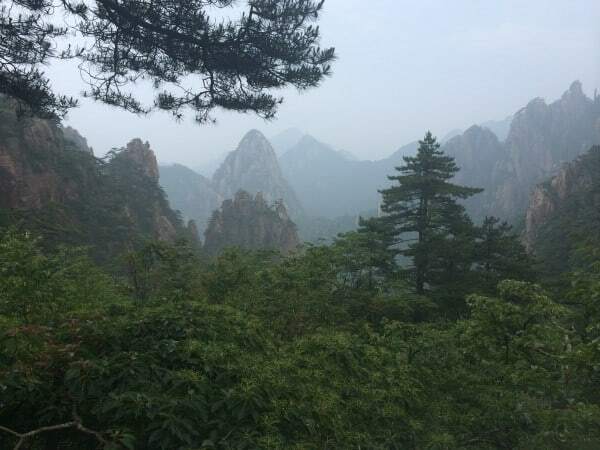 Even so, the walk down was 15 km and took us four hours, we took the longer, more scenic route – known commonly as the Western Steps (as opposed to the Eastern Steps – which we’d bypassed by using the Yungu cableway). Easier than the descent from West Peak to the North Peak Cableway on Huashan because the steps were much more uniform, but harder as the wind made it hairy, and the sheer number of steps were just overwhelming. We passed sedan chair offer after sedan chair offer, we passed folks on their way up. 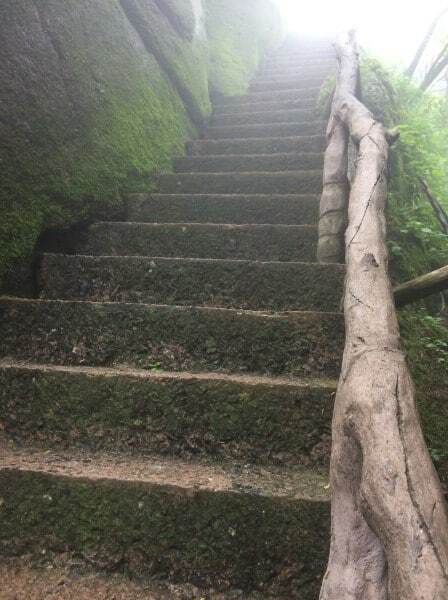 We peered at the Welcoming Pine through the fog and held on tight to handrails as we slipped down wet treacherous steps. We considered the small food, drink and souvenir stalls on the way down. The price here was just the same as the prices at the top, but here, everything has to be carried in, there’s no cable car to ease the load. Like we said on the Great Wall, anything we buy we have to carry, so thanks, but NO. 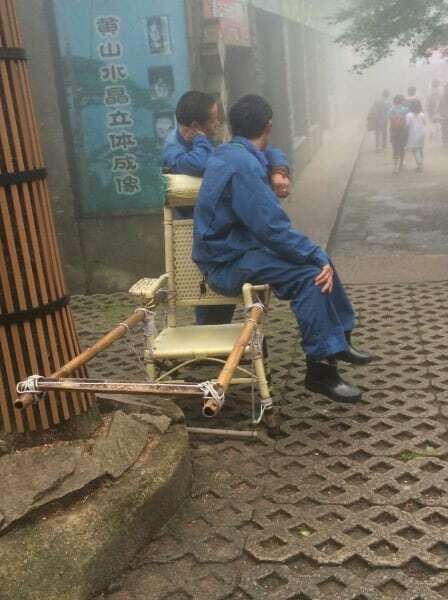 Especially to the child size bamboo chair, which seemed to have no place 3 km’s up a mountain. We passed porter after porter, some carrying what we calculated to be more than 148lbs of weight. And looking at them (and their calf muscles) you’ve got to believe that was actually more than their own body weight! 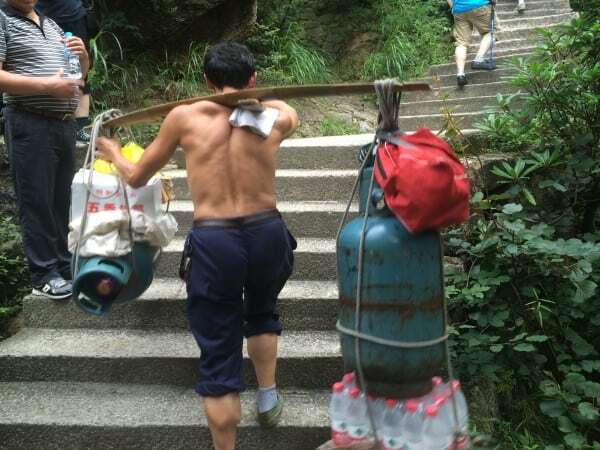 They carried rice, gas bottles, bottles of water, coke, vegetables. 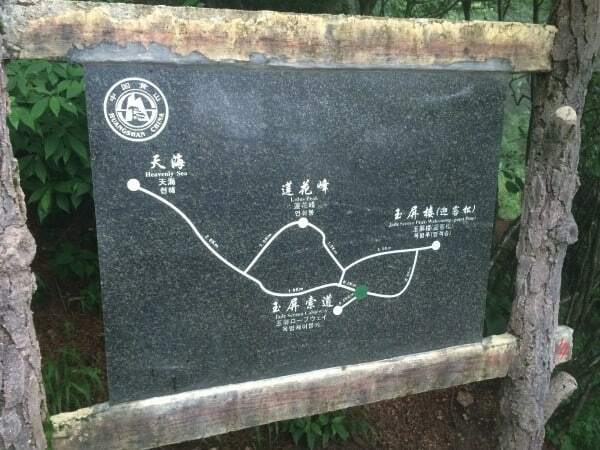 We saw groups of tourists, blindly following their guide, who in one of the most irritating features of a Chinese mountain, use small speaker sets to broadcast their patter. Don’t come to the mountains for peace and quiet..
We walked through the forest at the bottom, listening to the high pitched sound of the crickest, of insects and of something else, very loud and shrill. And we arrived at the bottom, paid our 18 CNY for the shuttle bus ,although you can actually walk down the road as well if you so wish. Before long we ended up back in Tankou. 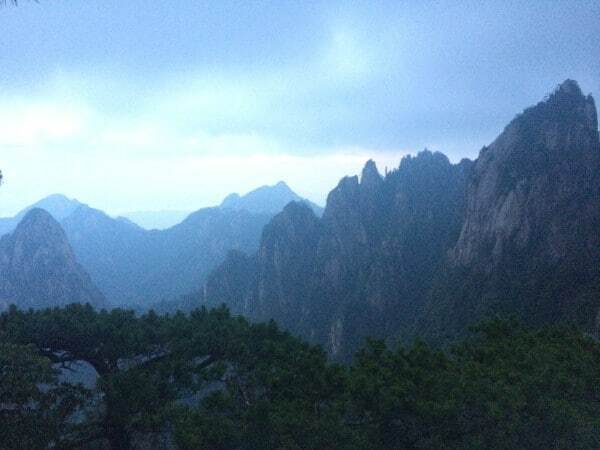 Huangshan won’t be our last mountain in China, but it’s certainly memorable. I can still recall the delight on that mist clearing. I remember how incredible it was to see the landscape change as daylight broke. The Back Seat of a Bus. Again. Spitting, Sneezing, Smoking, Shouting and Snoring.